New nails! I know, I've said before that I don't like matte nails, but look what we have here. Some matte nails!! I don't know why, but it seemed like a good idea in my head, so I decided to give them a try. Though I don't really know what to think about the result. I thought hot pink would look good with some matted grey and I guess it works to some point, but maybe it's the designs that don't really go with each other. I don't know. Usually after I'm finished doing my nails, I can't stop staring at them if I'm satisfied with the result. With these, I'm staring at them, but for a completely different reason: I'm thinking if I should remove them or not, hahaha. Anyway, my favourite points are probably the studs on the grey nails. I didn't have triangle-shaped studs, but I had some that are like this: ♦, so I just cut them in half and used those, haha. The gold foil also goes pretty well with the hot pink nail polish, because the polish has a slight shimmer to it too. It's not really visible at all in these pics, but see this to get an idea what I'm talking about. Aaaah, I had such a good vision in my head when I made these, but as it sometimes happens, I couldn't quite get my vision on my nails. Well, I guess this is what I'll be going with for the next few weeks anyway. What do you think about the nails? Wow! I think they look amazing! No ihan mielettömät, vähänkö olen kade!!! Ei voi kuin suu auki ihastella :)) ei uskoisi että mummokalsarikukat ja ristit toimivat samoissa kynsissä mutta niin ne vaan toimii!! Paljonko muuten menee aikaa tehdä tälläiset? Vau, upeet kynnet taas kerran :) Käytätkö sähköviilaa, jos käytät niin mikä merkki/malli? Upeat! Mä tuijottelen näitä varmaan vielä viikon :). Nuo kultaiset reunat mattakynsissä tuo mukavasti rytmiä ja ryhtiä mattaan! hmmm the grey, studs, skulls and gold reminds me of DIA and TutuHa. Both i like very much so my impression is it's very rokku! Siis tosi upeet kynnet! ♥ Wow! 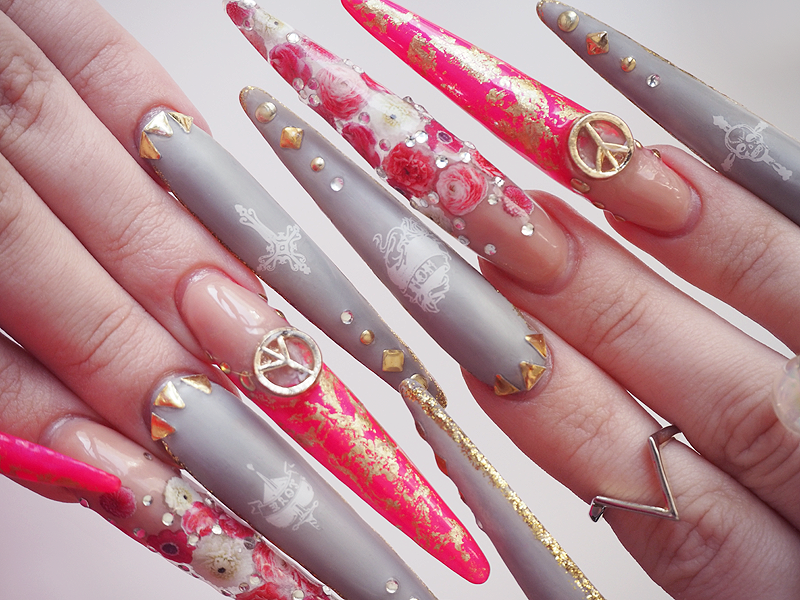 These nails are so amazing! Oon niin kaivannut sun kynsipostauksia! :-D mun mielestä toi harmaa on yks täydellisimmistä harmaista lakoista ikinä, haha! 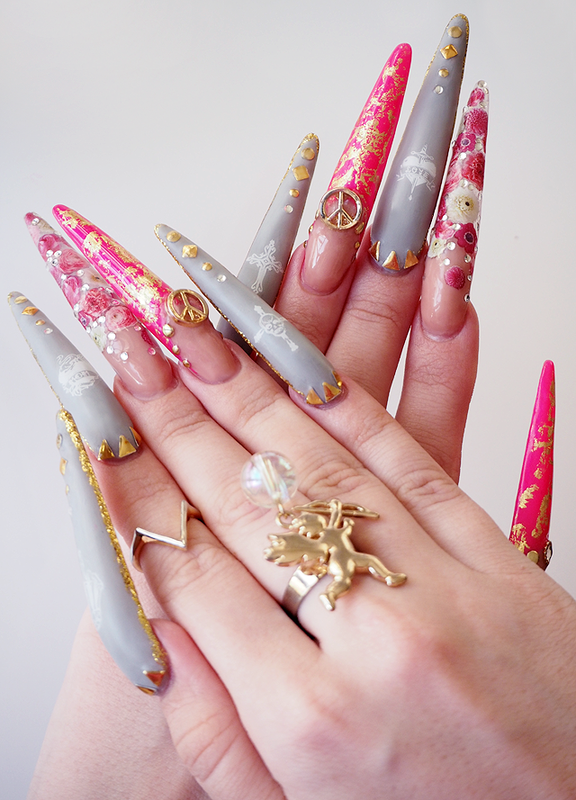 I love them *-* yeah I really love all your nail arts!